There is no RAID or local storage included (embedded) with the B200 M4 server. 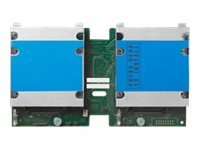 Therefore, the Cisco FlexStorage RAID controller must be purchased in order to support any (1 or 2) local hard disk drives (HDDs) or solid state drives (SSDs). For servers that will not need any local HDDs or SSDs (for example, for booting from SAN), you can order the server without the Cisco FlexStorage RAID controller with disk drive bays; however be sure to select the Cisco FlexStorage blanking panels.